If you have been injured in a motorcycle accident, it is important to find a lawyer with strong experience representing other motorcyclists. The lawyers at Breakstone, White & Gluck of Boston have over 100 years combined experience representing riders who have been injured across Massachusetts. In recent years, our attorneys have settled cases for $3.75 million, $3.5 million and $1.25 million. Read more about our motorcycle accident settlements. After an accident, learn your rights. Contact our attorneys at 800-379-1244 or 617-723-7676, or use our contact form, for a free legal consultation. We are conveniently located in Government Center in Boston and represent injured motorcyclists throughout Massachusetts. While motorcyclists travel the same roads as other drivers and follow many of the same regulations, they suffer a disproportionate number of the accidents and injuries in Massachusetts and across the United States. Motorcycle accidents can be traumatic both physically and emotionally. Nationwide, motorcycle accidents resulting in wrongful death account for more than 10 percent of all traffic fatalities. Others who are injured may face long hospital stays and months of medical treatment. In Massachusetts, motorcyclists are not required to receive no-fault Personal Injury Protection (PIP) benefits under the law. This is one of the first and most basic types of benefits provided to car and bicycle accident victims in Massachusetts and they are provided regardless of fault. 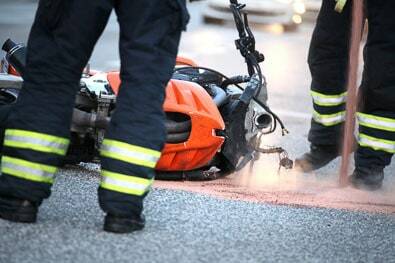 This absence of benefits and the severity of injuries motorcyclists often suffer make it critical to contact an experienced motorcycle accident lawyer immediately following a crash. The majority of motorcycle accidents involve a motorcycle and a passenger vehicle. Drivers are accustomed to looking for other cars and trucks on the road, but do not always watch out for motorcyclists in the same way. Accidents can result when drivers overcrowd motorcyclists, speed or cross the vehicle lane. Drivers can injure a motorcyclist by crashing into their bike or by operating in a negligent manner causing a fall or crash, even if there is no contact with the motorcycle. Distracted driving, cell phone use and texting while driving by motorists also leads to many motorcycle accidents. Many times, motorcycle accidents result in a rider leaving the scene in an ambulance. If you have been involved in a motorcycle accident and have not visited the hospital emergency room, you should seek immediate medical attention, even if you do not believe you have been seriously injured. The emergency room staff will evaluate you for broken bones, concussions and internal injuries, as well as document your injuries. Motorcycle accidents almost always cause serious injury and work disability along with significant property damage. After a motorcycle accident, your legal rights need to be protected. You should immediately contact an experienced Boston motorcycle accident lawyer to identify whether you have a case, potential parties who may be liable and investigate. In Massachusetts, motorcycle accident victims have three years to file claims under the Statute of Limitations. If you have been injured, contact us today for a free legal consultation at 617-723-7676 or toll free at 1-800-379-1244 or use our contact form. The Boston motorcycle accident lawyers at Breakstone, White & Gluck handle motorcycle accident cases in Boston, Brockton, Fall River, Framingham, Lowell, Lynn, Quincy, Springfield, Waltham, Walpole, Foxborough, Plymouth and throughout Massachusetts.